Using a chalkboard menu to announce the delicious food awaiting your wedding guests is a very creative way to add some personality and unique style to your wedding. You can have it handwritten or even try your own hand at it! The wedding guests will fall in love with this creative wedding menu idea and will highly appreciate this personal touch. Did you know you could provide your own recipe? Almost all caterers will agree to use your own recipe so why use generic catering menus when you can bring a recipe that’s been in your family for generations to your wedding table? This is such a lovely way to incorporate your family traditions into your wedding day. Plus, it will surely melt your wedding guests’ hearts! Everybody knows that signature cocktails are the creative way to share your personal favorites with the wedding guests during cocktail hour. Do you want them to talk about your creativity way past it? Go for some unexpected variations instead! Why not serve frozen popsicle cocktails? How about a milk and cookie cocktail? Set your imagination free and your guests will be amazed! There’s nothing more boring than an inanimately set table with “sterile” foods arranged in geometrical figures. Surprise your wedding guests with some action around the tables instead! Hire a chef that can shuck oysters or roll some sushi, for example, and you’re guaranteed both entertainment and excitement. Who wouldn’t want that? When the time comes for the wedding cake, everybody’s well stuffed (with food and memories of an unforgettable wedding). Now it’s the time to spice things up and get back your wedding guests’ attention with a one-of-a-kind wedding cake! Be creative – opt for a cupcake cake, a macaron cake, a doughnut cake if you wish – it is all up to you! 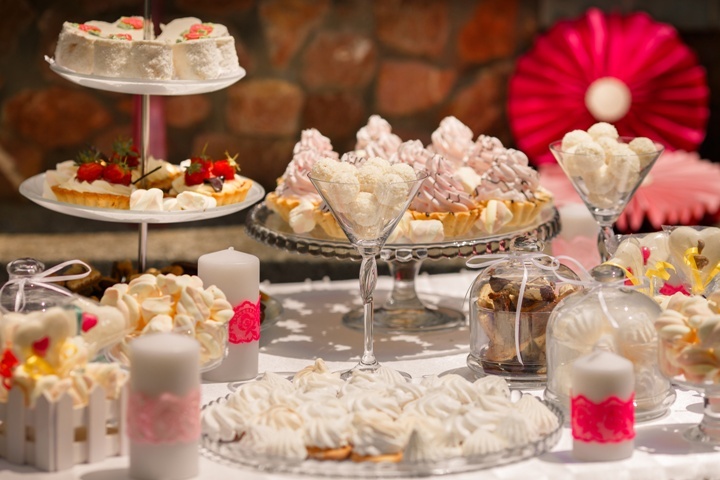 Food and drinks are an essential part of any wedding, but don’t forget that the guests have come to your wedding to have fun and share this magical day with you and your husband. Take it easy, enjoy yourselves and don’t let anything spoil this special moment!